Nintendo is a multinational consumer electronics and software company headquartered in Kyoto, Japan. Founded in September 1889 as a small Japanese firm producing handmade playing cards, Nintendo has evolved into one of the largest video games manufacturing companies generating about ten billion U.S dollars in net sales in 2018. The largest share of Nintendo's revenue is generated in the Americas, which contributed around 4.2 billion U.S dollars for the fiscal year of 2018. Nintendo possesses a global workforce of 5,501 employees as of 2017. 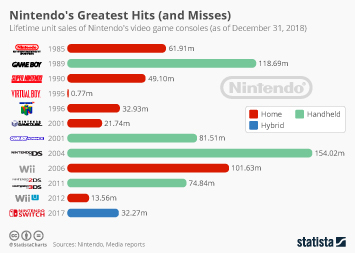 While its two main rivals in the gaming industry, Microsoft and Sony, rely almost solely on third-party software for their consoles, a significant proportion of Nintendo games are created and developed in-house. The company is known to have created some of the most popular video game franchises in the industry, such as Mario and The Legend of Zelda, and it also is a part owner of The Pokémon Company. One of the newest games in the Mario franchise, Super Mario Odyssey, has sold about 14 million copies as of December 2018. The Nintendo Wii (succeeded by the Wii U in 2012) is the company’s most popular brand product. As of its 2017 fiscal year, Nintendo has sold altogether 115.2 million Wii and Wii U consoles worldwide. However, Wii's success has come to an end, being replaced by that of Nintendo's newest console, the Switch, which sold about 32.3 million units as of December 2018, since its release in March of 2017.